Jillian Noel "Jill" Hennessy (born November 25, 1968) is a Canadian actress and musician known for her television roles on Law & Order and Crossing Jordan. Hennessy was born in Edmonton, Alberta. Her father, John Hennessy, was a meat salesman and sales/marketing executive, a job that required considerable travel and resulted in frequent moves for the family. Her mother, Maxine, a secretary, left the family in 1982, leaving her daughter to be partially raised by her paternal grandmother, Eleanor, in Kitchener, Ontario. She has a younger brother, John Paul "J.P." Hennessy Jr., and an identical twin sister, Jacqueline, who is a magazine writer and TV show host in Canada. Hennessy has Irish, French, Swedish and Italian ancestry on her father's side, and mostly Ukrainian, as well as Austrian, ancestry on her mother's. She graduated from Grand River Collegiate Institute in Kitchener, Ontario and used to busk in the Toronto Subway. Hennessy and her sister played twin call girls in 1988's Dead Ringers. She was short-listed for the role of Dana Scully, on The X-Files. In 1993, she played Dr. Marie Lazarus in RoboCop 3. Hennessy is most well-known for playing assistant district attorney Claire Kincaid on Law & Order (1993 – 1996) and for playing the lead role as medical examiner Jordan Cavanaugh on Crossing Jordan. In 1999 she played Lisa in Chutney Popcorn. In 2000, Hennessy wrote, produced, and co-directed with Elizabeth Holder an independent film called The Acting Class. Inspired by a true story, the mockumentary looks at the trials and tribulations of a dysfunctional acting class. The film co-starred her sister, and included cameos by a number of Hennessy's former Law & Order co-stars. In 2001 she portrayed Jackie Kennedy in the film Jackie, Ethel, Joan: The Women of Camelot. In 2003 she made a cameo appearance in the film Abby Singer. She appeared on Broadway in the musical Buddy - The Buddy Holly Story in 1990. From 2001 to 2007, she appeared in the tv show Crossing Jordan as Jordan Cavanaugh. Most recently, she portrayed Tim Allen's wife in the 2007 film Wild Hogs. On June 9, 2007, she received a star on Canada's Walk of Fame. Hennessy has recorded an album in Austin, Texas, Ghost in My Head, which was released in June 2009. She performed as a guest of the Indigo Girls on a November 2009 show of Mountain Stage and was the focus of a show for herself later that same month. She performed on the Village Stage of the 2010 edition of Lilith Fair. Hennessy is multi-lingual, and speaks English, Italian, French, Spanish and German. She married Paolo Mastropietro, a former bartender and sometime actor, on October 1, 2000. Her husband opened a tavern in Northvale, New Jersey, in 1999, and named it Hennessy Tavern, after his wife. Hennessy plays the guitar and sings and enjoys riding motorcycles with her husband. They had a second marriage ceremony in January 2001, which took place at New York City Hall with Mayor Rudolph Giuliani officiating. Their son, Marco, was born on September 17, 2003 and second son Gianni born on November 21, 2007. 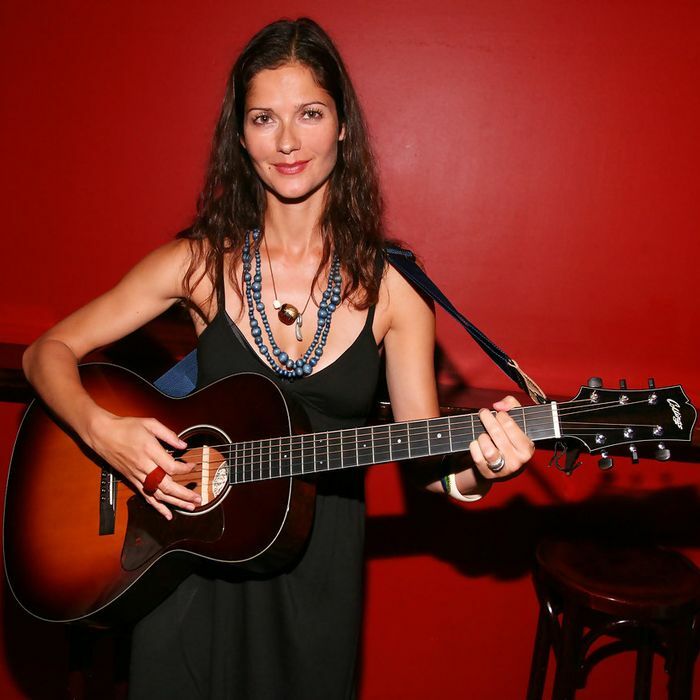 The Minneapolis-based band Mollycuddle wrote the song "The Ballad of Jill Hennessy" in honor of the actress. Hennessy was reportedly very pleased, and offered to perform with the band on rhythm guitar.